SecuraSoft™ EML to PST Converter is one of the best solution available to convert EML Files from Microsoft Outlook, Microsoft Entourage, Mozilla Thunderbird, Windows Live mail,Windows Mail and many more to MS Outlook PST format. View, Examine and analyse email messages in different viewing modes. Provide Option to split a large size converted PST file. Inbuilt feature to Preview Email attachments. Provides support to multiple email clients that create EML File format. Convert EML or PST by Maintaining Message Formatting & Attributes. With EML to PST conversion utility User can change the default location of converted PST file. Alternatively software also allows you to make a new folder and save the converted Outlook PST file by browsing the location of their own choice. The tool supports EML files created by emailing applications like Microsoft Outlook express, Microsoft Entourage, Mozilla Thunderbird, Apple Mail, IncrediMail, Windows Mail, Windows Live Mail and many more. The tool provides an option to preview email messages in different viewing modes like: Normal, Hex, property, MIME, HTML, Message header view, HTML view, RTF view, Attachment view. The software provides the option to split converted large PST file into multiple smaller size PST files. The Application to convert outlook express files to PST also provide option to divide large size PST file on the basis of size. Then the resulting smaller size files are of “size” specified by user. Convert outlook express files to PST tool provides option to preview E-mail attachment of a corresponding EML file. Tool allows user to save the attachment on user local machine. User can import EML to Outlook using any any of the two options that is Selective or Batch mode. In batch mode multiple files are migrated at once. In selective mode only selected files by user are migrated to PST format. EML to PST conversion tool sort emails In EML format on the basis of properties like To, From, Sent Date, Received Date, Size in KB and subject. Application to Convert Outlook Express files to PST generate a UNICODE type PST file by default. This helps in storing large number of emails in a PST file as Unicode type PST file belongs to Outlook 2007 and later versions of Outlook which have capacity to store up to 20 GB of data. By default display mode is horizontal .User can change display mode from horizontal to vertical or vice versa. User can view all the emails in any of two display modes available. Tool used to export EML to PST allow user to browse the folder having EML files and also provide feature to auto load all the emails in EML format having related properties along with item count. It is an excellent tool to convert multiple EML to PST file format. I used it to migrate 500 EML files to PST file format. Very fast tool at an affordable price. Kind of a data savior and I must say tool has a very easy to use interface. Thanks team. This Application is an ultimate solution. I used it to convert EML file created in Mozilla Thunderbird to PST format. It is a very reliable tool. I was able to transfer all my emails securely to PST MS Outlook Format. With Just few clicks emails in EML format converted to PST format. Very amazing software. Thank You so much Securasoft!! I used this software to migrate EML to Outlook 2007 PST format. Superb software. A full feature product. I am thankful to team as all my attachments and messages are perfectly transferred in PST format. I am really happy as no data is lost. This tool is so awesome that even a non-technical person can use. SecuraSoft™ EML to PST Converter is one of the best solution available to transfer EML files To PST format. I used it to convert few EML files of subject “exam” to PST format. It is such a wonderful tool as we can sort our emails in EML format on the basis of From, To, Sent date, Received date .Very easy to use application. EML File Format: EML is a file extension used by Outlook express to store single e-mail message to a file .The file contains e-mail and its corresponding attachments. PST File Format: Personal storage table format is an Outlook data file that stores email messages,calendar and many more items for web-based mail accounts or to save emails and other items on local machine . EML File format stores a single email message whereas PST format store the entire mailbox. In case user upgrades his Windows operating system then *.EML format files could not be accessed immediately. User cannot open multiple EML files at once so transfer EML to PST FILE FORMAT to open whole mailbox content in one PST file. To migrate batch of EML files to PST file format . Convert EML to PST without installing Outlook. Migrate EML to PST tool provides option split large size PST file. Import EML to PST foramt along with attachments. Preserve the email meta data after conversion to PST file format. 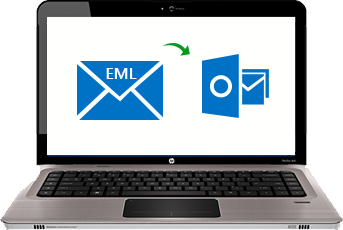 Export EML to Outlook App provide option to select and auto-load EML files.